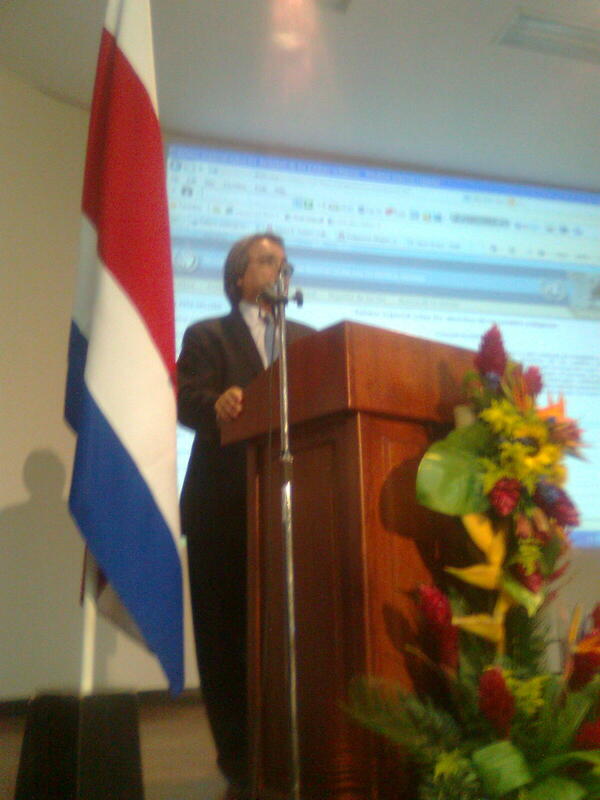 The Special Rapporteur on the rights of indigenous people, James Anaya, visited Costa Rica last 25-27 April 2011. He was invited by the Government to assess the impact of the hydroelectric dam “El Diquis”, that will be built in the indigenous territory of Terraba, on the local communities settled in this area. 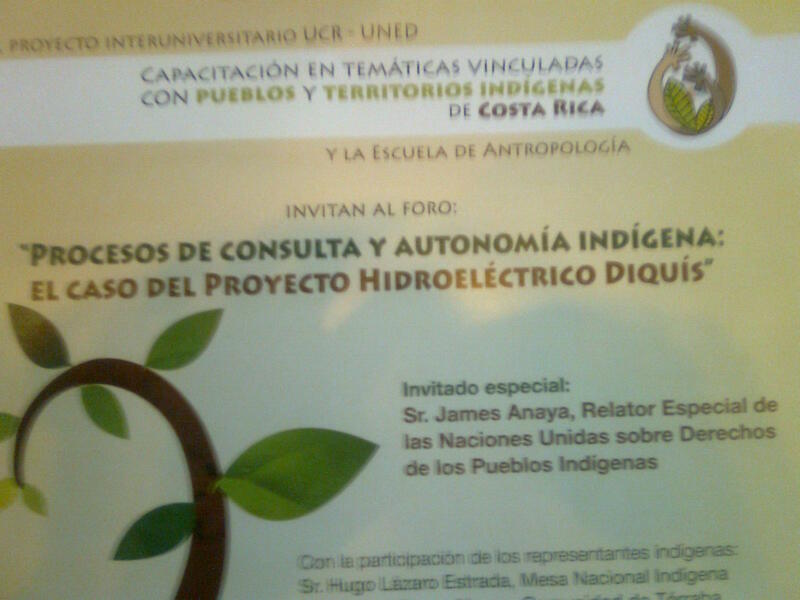 In other words, his task was to verify if the hydroelectric project carried out by Costa Rica Government would imply a violation of indigenous people’s rights. On April 25 and 26, the Special Rapporteur had a meeting with members of the indigenous communities affected by the hydroelectric project, to which followed, on April 27, a public Forum titled “The consultation process and the indigenous autonomy: the case of the hydroelectric project of Diquís”, organised by UNED (Universidad Estatal a Distancia) and UCR (University of Costa Rica). Ivania Villalobos on behalf of VIDES Costa Rica attended the meeting. 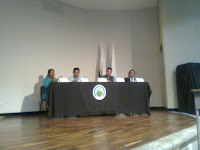 During his intervention at the university, Mr. Anaya recalled article 7 of the ILO Convention on Indigenous and Tribal Peoples, which states: “…Governments shall ensure that, whenever appropriate, studies are carried out, in co-operation with the peoples concerned, to assess the social, spiritual, cultural and environmental impact on them of planned development activities. The results of these studies shall be considered as fundamental criteria for the implementation of these activities”. In this regard, VIDES Costa Rica stress that before the implementation of the Diquis dam project, the Government didn’t involve actively indigenous communities living in the area. In fact, there was neither a previous agreement nor a consultation with the indigenous communities concerned. During the meeting held on April 27, the representative of ICE (the Costa Rican Institute for Electricity, in charge of carrying out the construction of Diquis dam) announced the willing of planning a local consultation with indigenous peoples settled in Terraba area. Moreover, it is important to highlight that violations of the indigenous people’s rights are perpetrated not only in Terraba territory, but also in Talamanca district, where many unmanned lands, traditionally belonging to indigenous communities, are considered terra nullius. Therefore, legal property documents of such lands are given to strangers. Despite the existence of several international conventions and domestic laws to protect the rights of indigenous communities¸ Costa Rican authorities constantly violate these rights. Accordingly, VIDES agrees with Special Rapporteur: education plays a key role to prevent future violations. It represents the main vehicle to empower indigenous peoples and to make them aware of their rights. Knowledge and awareness are major tools to defend the dignity of persons. Many challenges still remain concerning the full implementation of indigenous people’s rights in Costa Rica, but the visit of the Special Rapporteur brought a “ray of light” allowing to open a national forum where all actors involved in the issue of the Diquis dam can discuss and share their views.